Last week the federal government released its latest report on gross output (GO), a much broader and more accurate measure of the economy than gross domestic product (GDP). 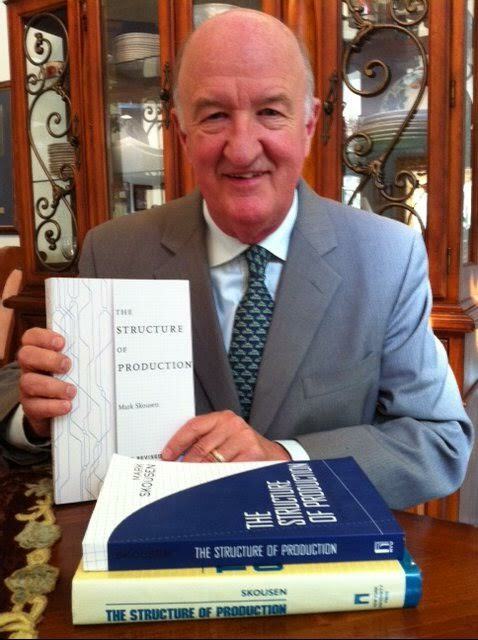 Long advocated in my book, “The Structure of Production,” GO accelerated in the second quarter of 2015, indicating a more robust economy than GDP data reports. Based on data released last Thursday by the federal Bureau of Economic Analysis (BEA) and adjusted to include all sales throughout the production process, real GO grew by 4.6% in the second quarter of 2015, considerably more than the 3.9% annualized growth rate of real GDP. Adjusted GO reached $39.0 trillion in the second quarter, more than double the size of GDP, $17.9 trillion. Based on my reading of a growing GO, I expect higher stock prices ahead — and maybe even higher gold prices. Gross output (GO) is an attempt to measure the “make” economy, i.e., total economic activity at all stages of production, similar to the “top line” (revenues/sales) of an accounting statement. In April 2014, the BEA began to measure GO on a quarterly basis along with GDP. Gross domestic product (GDP) is an attempt to measure the “use” economy, i.e., the value of finished goods and services ready to be used by consumers, business and government. GDP is similar to the “bottom line” (earnings) of an accounting statement, which determines the “value added” or the value of final use. GO tends to be more sensitive to the business cycle, and more volatile, than GDP. During the financial crisis of 2008-09, GO fell much faster than GDP and, afterwards, recovered more quickly than GDP. Still, it wasn’t until late 2013 that GO fully returned to its 2007 peak. The fact that the adjusted GO is still growing slightly faster than GDP suggests that the economic recovery is ongoing and positive for the stock market. I also have created a new B2B Index based on GO data. B2B activity rose only 1% in the second quarter. According to the new Skousen B2B Index, business spending rose to $22.7 billion in nominal terms, compared to $22.4 trillion in the first quarter. Meanwhile, consumer spending remained stable. 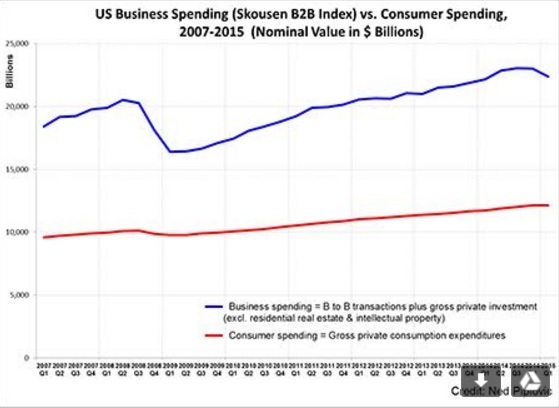 The chart above demonstrates clearly that business spending is much larger than consumer spending. Consumer spending amounts to about a third of total economic activity, not two-thirds as commonly reported in the media. Business spending represents more than half the U.S. economy. The GO data and my own B2B Index demonstrate that total U.S. economic activity has picked up, and a recession has been avoided for now. B2B spending is, in fact, a pretty good indicator of where the economy is heading, since it measures spending in the entire supply chain, and it indicates continued modest growth. I first introduced GO as a macroeconomic tool in my work “The Structure of Production” (New York University Press, 1990). A new third edition has just been released with a new introduction and is now available on Amazon. On Tuesday, my wife and I attended the Reason Media Awards at the Edison Ballroom in New York City. Among the 275 guests was James Watson, recipient of the Nobel Prize in Medicine for his co-discovery of the mapping of DNA in 1953. I met him for the first time at a Milken Conference in Los Angeles. Watson is a brilliant scientist but has, over the years, made some controversial statements about race and women, causing him to lose his position at Cold Spring Harbor Laboratory in New York and to sell his Nobel Prize medal for $4.1 million in 2014. Another attendee at the Reason dinner was scientist Matt Ridley, author of the new book, “The Evolution of Everything.” He was the keynote speaker. He had a fun line in his talk: “What’s the opposite of diversity? University!” He was referring to the growing censorship and politically correct (PC) activities that are occurring on college campuses these days. In case you missed it, I encourage you to read my e-letter column from last week about my surprising discovery at the New Orleans Conference. I also invite you to comment in the space provided below. Stock market guru Chris Versace discusses the development of the "Internet of Things" investing trend.